← Design against climate change – suggestions for a project? Editor’s note: recent publication of a study about the coming collapse of civilizations has most probably encouraged the author to submit this work for review. Due to its nature, we felt it best to present it to the whole world for a thorough peer review. A large number of explanations have been proposed to account for the collapse of various historical societies. 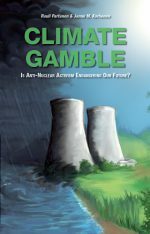 As Tainter (2014) recently argues, earlier scholars have ascribed collapses to result from elite mismanagement, class conflict, and peasant revolts, while the increased emphasis on environmental issues has inspired modern scholars to suggest that societies have collapsed due to depletion of critical resources, such as soil and forests. Most recently, some studies have suggested that inequality and elite resource consumption leads to societal collapse (Motesharrei et al, in press). However, these explanations do not focus on what seems to us to be the most pertinent explanation for the collapse of these early societies. It is common knowledge that the earlier societies – examples of which include the Roman Empire, the Mesopotamian civilization, and the Maya civilization – did not possess a modern scientific establishment. As a result, we argue, these societies could not escape their predicaments by developing novel technologies in order to curb elite mismanagement, reduce environmental impacts, or defuse class conflict via widespread Netflix subscriptions. where I stands for Impact, P for Population, A for its Affluence, and T for Technology. Improvements in technological efficiency can reduce resource intensiveness, and therefore reduce the variable T (see also Chertow, 2000). Technological change can even allow us to substitute between different resources, as was the case when whale oil business was outcompeted by mineral oils. Therefore, it stands to reason that improvements in technology could allow us to postpone or even forestall a societal collapse. While “technology” is somewhat difficult to operationalize, a useful proxy may be found from the share of population with the highest academic degree – the doctorate. As an example, countries ranking highest in PhD graduates per capita (as of 2010, in descending order, Switzerland, Sweden, Germany, Finland, Austria, Denmark) typically score highly in various environmental sustainability and related indicators. It may therefore be surmised that PhD education may help societies forestall a coming collapse. To test this intuition, we develop a simplified computer model. Following the lead of recent studies, we base this model on the well-known Lotka-Volterra or predator-prey model. The additions to this model are as follows: besides renaming the variables (i.e. P, “population,” and N, “nature”), we add a variable T or “technology” to represent the stock of useful knowledge available for forestalling collapse – e.g. 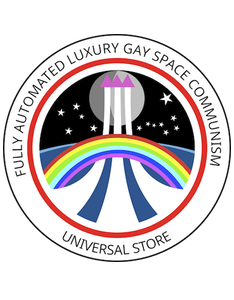 the variety of computer games available for amusing the lower social strata. where b is a constant. A system dynamics diagram of the model can be found in Figure 1 below. The model has been implemented on NetLogo (Wilensky, 1999), based on a predator-prey model by Wilensky (2005). Figure 1. System dynamics diagram of the model. The results of three representative scenarios are shown below. In the Scenario 1, the society chooses not to support PhD students at all (Q_PhD = 0). As can be seen from the Fig. 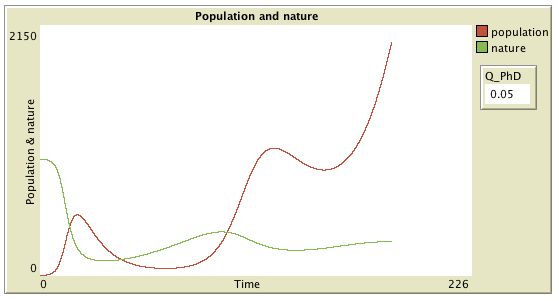 2, this forces the society into a cycle of growths and collapses, with a downward trend in the population peaks. We posit that such a scenario – lack of support for PhD students – is as likely a cause for the collapse of historical civilizations as any single reason so far suggested. Figure 2: Cyclical collapse of a society that does not support PhD students. In the Scenario 2, the society chooses to support PhD students rather stingily (Q_PhD = 0.05). 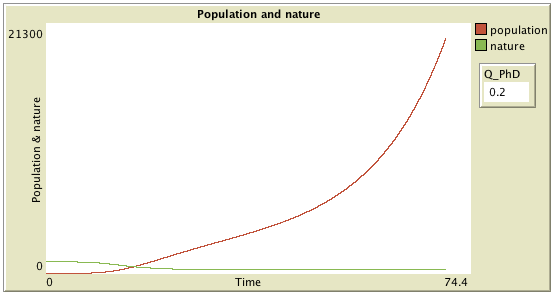 Figure 3 shows the results: in this case, the population will suffer from several collapses before stock of technology allows it to transcend the limits of natural stocks. Figure 3: A cycle of booms and busts, followed by breakout, experienced by a society that offers only limited support to PhD students. Finally, in the Scenario 3, the society supports PhD students generously (Fig. 4). Collapse is avoided entirely, allowing the population to grow nearly exponentially. Figure 4: Near-exponential growth in a society that generously supports PhD students. Based on the model described above, we conclude that collapses can occur in a limited system. However, collapse can be avoided with judicious policies. In particular, the model suggests that generous support for PhD students is essential for achieving this goal. We therefore implore policy-makers to adjust policies accordingly; a stipend of 4000 € per month should suffice. The NetLogo model can be downloaded here. The NetLogo itself can be freely downloaded from here. Chertow, M. R. (2000). The IPAT Equation and Its Variants. Journal of Industrial Ecology 4 (4): 13–29. doi:10.1162/10881980052541927. Ehrlich, Paul R.; Holdren, John P. (1971). Impact of Population Growth.Science 171 (3977): 1212–1217. JSTOR 1731166. Motesharrei, S., Rivas, J., and Kalnay, E. (forthcoming). 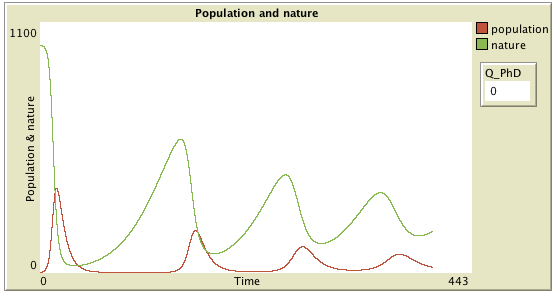 Human and Nature Dynamics (HANDY): Modeling Inequality and use of Resources in the Collapse or Sustainability of Societies. In press. Wilensky, U. (2005). NetLogo Wolf Sheep Predation (System Dynamics) model. 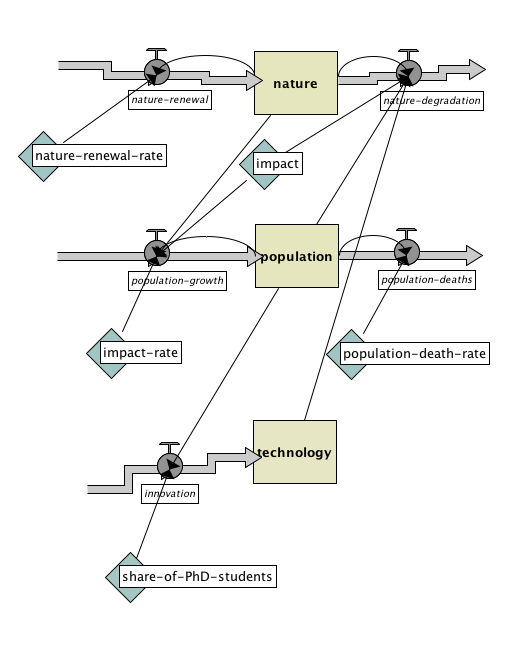 http://ccl.northwestern.edu/netlogo/models/WolfSheepPredation(SystemDynamics). Center for Connected Learning and Computer-Based Modeling, Northwestern Institute on Complex Systems, Northwestern University, Evanston, IL. This entry was posted in Simulations and tagged collapse, humour, Modeling, Simulations. Bookmark the permalink. I think it is deeply problematic that this study ignores the important role that support for more senior faculty plays. The resulting equations therefore are too simplified to reflect reality. More support for senior faculty implies reduced stress for PhD students allowing them to focus more on developing technology. We thank you for your insightful comments and criticism, which we feel will greatly improve the paper. While we acknowledge your criticism that the model, as presented, is simplified – perhaps overly so – we feel that this simplification is justified in the name of analytical tractability. Furthermore, we do not believe that a more complex model would significantly change the outcome. While adding “senior faculty” to the model could, on first impression, increase the perceived realism of the model, we are unsure what real effects it would have. Indeed, one could argue that the variable Q_PhD already acknowledges the role for senior faculty and other supporting infrastructure. Furthermore, we believe that it is the PhD students that do the actual work, in any case. We therefore thank you again for your comments, and hope that our clarifications are sufficient. The purpose of the post above is to get you, my dear Reader, to think critically about the limitations of using simplified models to explain or predict extremely complex phenomena. While it is inspired by the study of Motesharrai et al. – which went viral, thanks to catchy headlines such as “NASA study proves civilizations about to collapse” – it is not meant as a critique of Motesharrai’s work as such. Indeed, such simple “toy models” can be useful learning tools when one is attempting to understand the dynamics of complex systems. For that purpose, very simple models may often be the right choice, and the aforementioned paper makes an incremental improvement in an earlier model. As such, it is a valid area for research, and the paper itself is valid science. However, the conclusions that some people draw from the model are anything but. As I hope you will now understand, computer models can be constructed to support just about any argument. In fact, while the above post was definitely written tongue in cheek, I think there is a distinct possibility that it will prove to be more realistic than Motesharrai et al’s model. However, it is simply impossible to draw any firm conclusions or policy recommendations from these models – and, I believe, from any model that attempts to “predict” how such a complex system as human society will behave over long timespans. Simple models are, well, simple, and they are likely to ignore many factors that may have a big impact over longer timespans. While one may think that that could be solved by adding enough variables, simply adding more equations into a model probably won’t improve accuracy: then the model becomes sensitive to minor differences in initial values. As chaos theory tells us, very small initial differences in complex systems – or models – can result to wildly diverging end results. What we therefore may learn from these models is, fundamentally, that collapses can happen, but that they are not preordained. I’m not sure whether we need fancy modeling for that conclusion, though. Very interesting piece. You might have seen this article which is really depressing about the rate that college professors get paid compared to coaches in the U.S. Pretty horrible.